Congress may still be in a dilemma about the ultimate solution to the financial problems in the country. Congress may still be in a dilemma about the ultimate solution to the financial problems in the country. However, it is not only the federal government that is in utter confusion. You too have your own financial problems and issues. You're susceptible to mistakes just like the federal government. Forget about the financial mistakes you've committed in 2013. Rather, stop making decisions that will make you fall from the edge of the financial cliff. 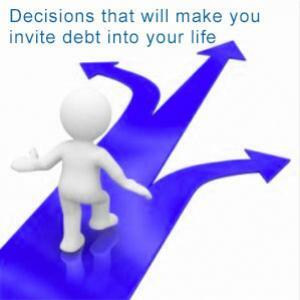 If you've no clue about the decisions that can make you jump into the debt sea, then go through the following sections of the article. 1. Taking out payday loans: It is very tough to get out from the vicious cycle of payday loan trap. If you really need quick money for an unanticipated expense, then try to borrow money from friends or family members. Are you confident that you can pay off the debt by your next paycheck? Well, in that case ask yourself a simple question. If you didn't have money to meet the unanticipated expense, then how will you have money to pay off the high interest payday loan debt? 2. Not planning for retirement for several reasons: Retirement planning is important and essential. If you think that you'll start your retirement planning after winning a lottery, then you're perhaps making the dumbest decision of your life. First of all, the chances of winning a lottery are very less. Secondly, you can meet an accident and may have to leave your job all of a sudden. Have you thought who will take care of your family in such a situation? Retirement planning is as important as paying off your debts. Give importance to it and save money for the golden years of your life. 3. Not saving for emergency as you've less money: This is a good way to welcome debts with open arms. Emergency expenses can crop up at any point of time. If you haven't saved enough money for the sudden expenses, then you can never be in control of your financial life. 4. Going to a costly college without a career plan: You're not making a wise financial move by taking out a huge student loan without a definitive career plan. You can end up getting immersed in student loan debt sea without having a clue about your career. Unless you know about what to do for a career, keep your expenses under control. Get admitted to a community college or a less expensive university. Make sure you're borrowing less amount of money for college. 5. Buying a costly item only because interest rate is low: It is a good financial move to buy an item at a low low interest rate. However, buying an item only because the interest rate is low is a financial mistake. If you really have extra money, then save it for your emergency fund or retirement. You can even use the money to pay down your debts. 6. Applying for a job without checking your credit report: Several employers go through applicants' credit reports as part of the recruitment process. If you don't know the complete story of your credit report, then you may well lose the opportunity to be the finalist. You may face astonishing questions about your credit report about which you don't have any clue. Worse, you may end up loosing a job just because of multiple errors on your credit report. Finally, never become a co-signer for your friend unless you can afford to make payments on the loan. You can never predict future. If your friend is unable to make payments, then you'll have to arrange money for the loan. Other than that, you'll risk losing your friendship because of the loan. Page loaded in 0.982 seconds.